A bluish-green mat of leaves amidst last years now brown growth. Leaves either pointedly toothed or rounded toothed. The leaves are also edged with a thin white border. Note hairs on underside of last-years leaves. Hairs spreading rather than appressed, most under the leaf, but as can be seen here the upper surface of some leaves also have hairs. At the rear are ten pointed sepals, an outer and an inner set; the outer set is usually hidden from above. Stems hairy. Five triangular pointed sepals plainly visible in-between the petals. The small central yellow sphere eventually becomes the (small) fruit. 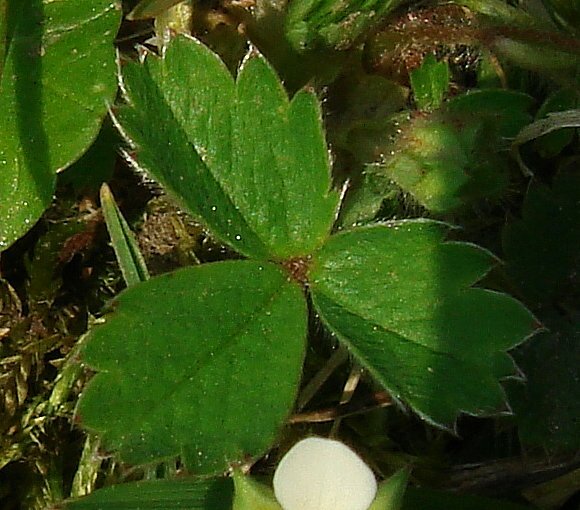 A very low plant; half the height of Wild Strawberry. 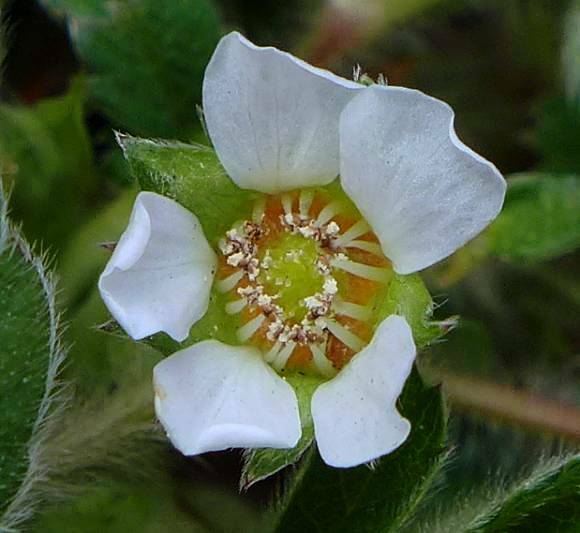 The five white petals are widely separated with large gaps un-like those of Wild Strawberry. The petals have a slight notch at the end. 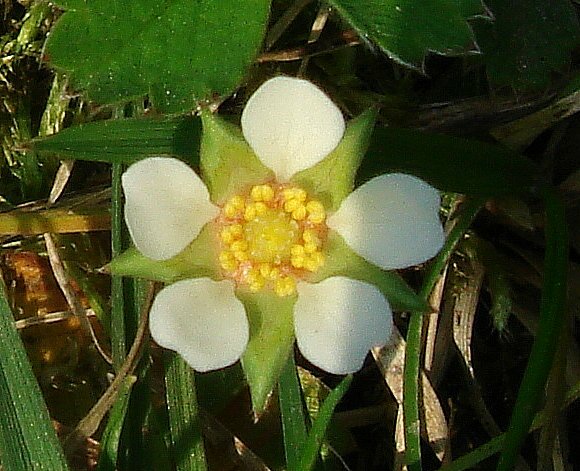 The petals have a slight notch in the centre, unlike those of Wild Strawberry. The stamens are initially parallel or converging to the styles, but as the anthers dehisce they move towards the styles coming in to close contact with them before the stamens separate once again adopting a radial arrangement. This dance does not result in any self-fertilisation, the pollen is probably(?) sterile. Your author cannot find out whether it is the pollen which is sterile, the styles, or both. The barren dry fruit forming within will be quite un-strawberry like both in flavour and texture. Wide spacing between the petals. 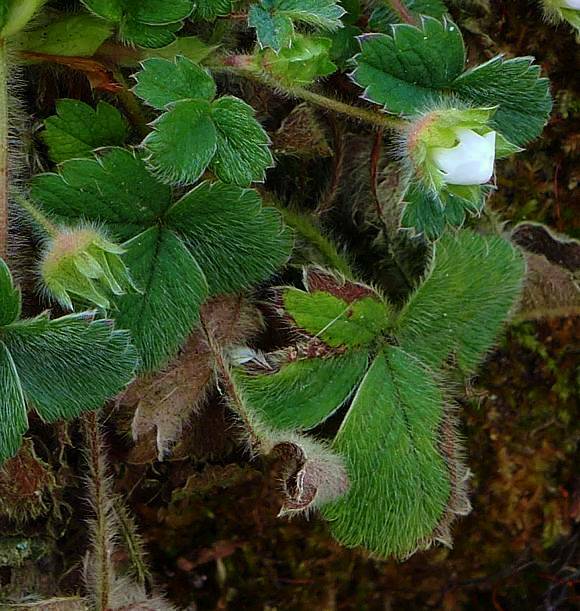 Matt-green less sharply veined trefoil leaves than those of Wild Strawberry. 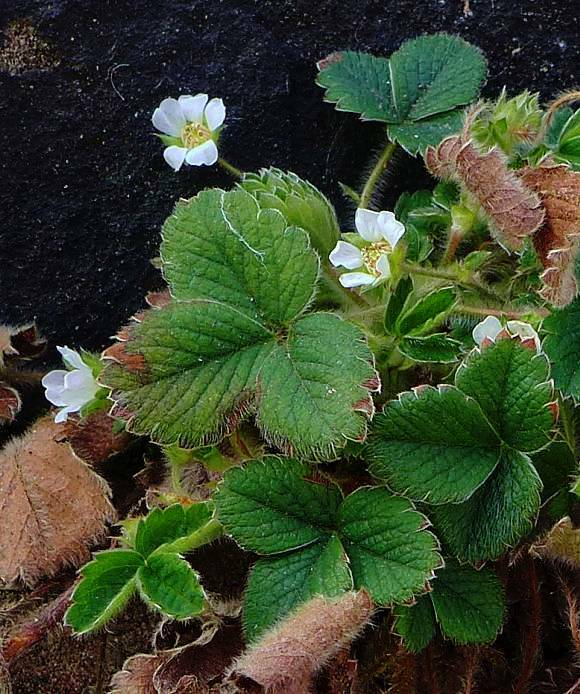 Leaves have fewer teeth, and again unlike those of Wild Strawberry, the terminal tooth is shorter than the two adjacent teeth. Also, the hairs are not appressed but spreading instead. The tip of each leaf tooth has a short point. 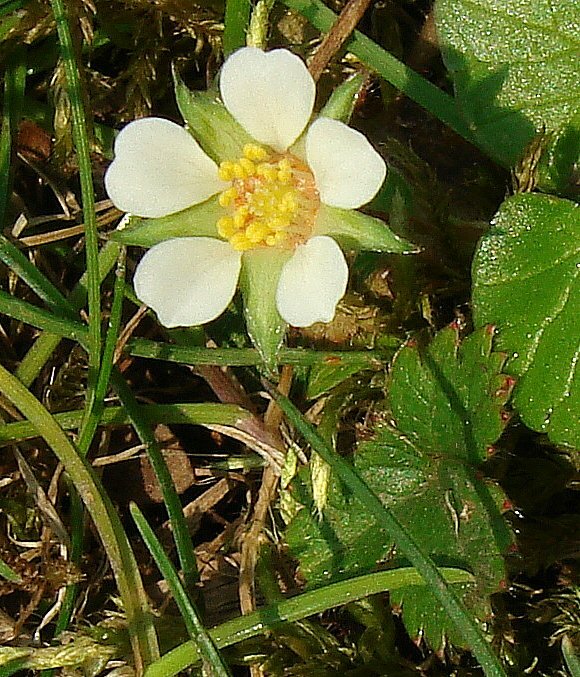 Possible confusion with : Wild Strawberry but that has petals which are much closer together without the wide gaps. Not to be semantically confused with : Strawberry Tree (Arbutus unedo), or Strawberry Dogwood (Cornus kousa) another tree nor with Barren Broom (anisantha sterilis), a grass. 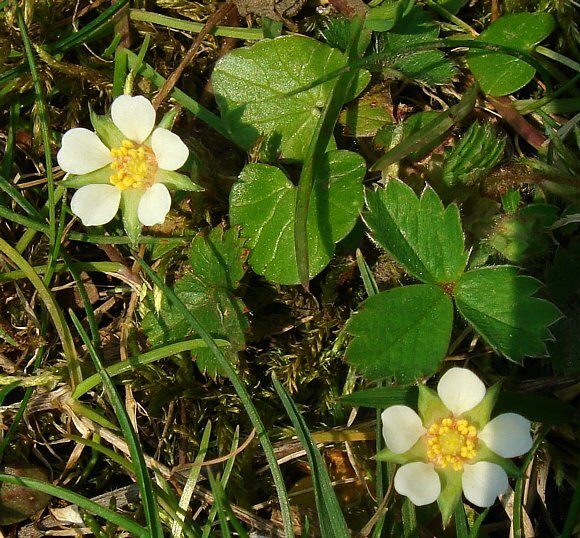 Flowers from much earlier than does Wild Strawberry or Garden Strawberry, starting from February and finishing earlier too in May. The fruits of Barren Strawberry are in-edible and most unlike those of either Wild Strawberry or Garden Strawberry. 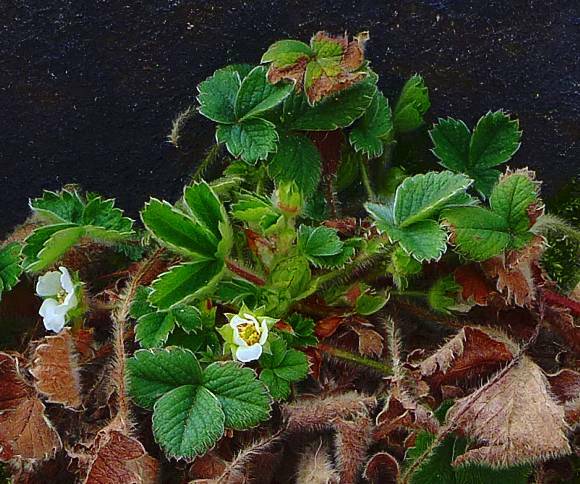 Strangely, Barren Strawberry is under a different Genus (Potentilla) than that of either Garden Strawberry or Wild Strawberry (Fragaria). 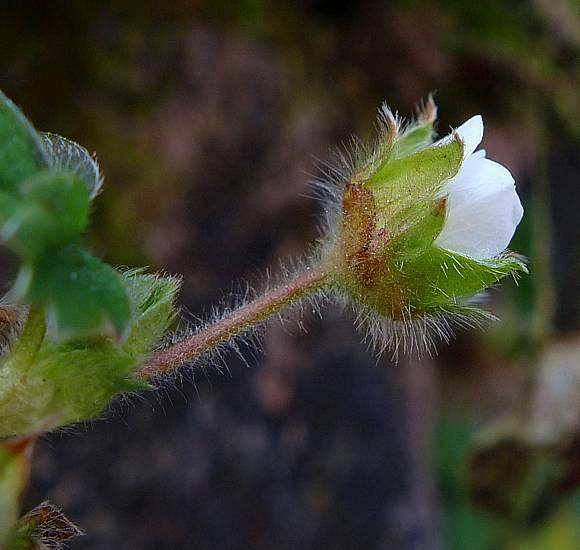 Strawberry has been found to contain some ellagitannins, amongst them Potentillin and its dimer Anemoniin .